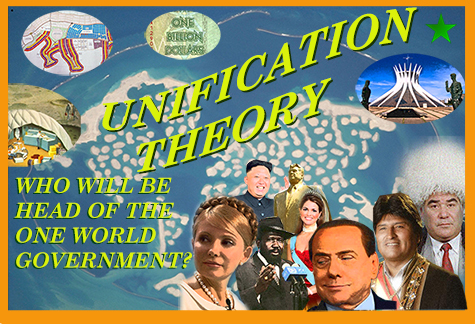 Unification Theory is a new game performance that pits world leaders against each other an a range of contests to see who will become the next leader of the one world government. Players will race around the world collecting votes by demonstrating their knowledge of global issues and culture, and besting each other in a variety of mental, creative and physical challenges. The game is meant to raise the obvious point that we live in a global culture, yet we are still divided, and know very little outside of our own cultural bubbles. Borrowing upon the cultural aspects of unification strategies of previous movements, Unification Theory exalts generalist knowledge of our human world as the first steps to a more harmonious and inclusive global society. While we have been subject to globalization, we have not yet globalized. We still see the world as a set of united nations rather than one political and societal entity. This artificially created division is beneficial to those who have the power to exploit it, and severely detrimental to those that cannot, especially those that are completely unaware of their situations and the consequences of these false divisions. While capital can flow relatively freeley throughout the world, people cannot; this restriction of movement will basically cause only two things: poverty and extremism. If we are truly going to move forward to deal with the challenges facing us, we must do so united, without these separations, and with everyone enjoying the rights as a true global citizen.